When life hands you lemons, you make lemonade—and open a stand. Obviously. Especially if you’re a young girl who wants to make a few bucks and spend her summer doing more than binging on Netflix and watching YouTube videos. 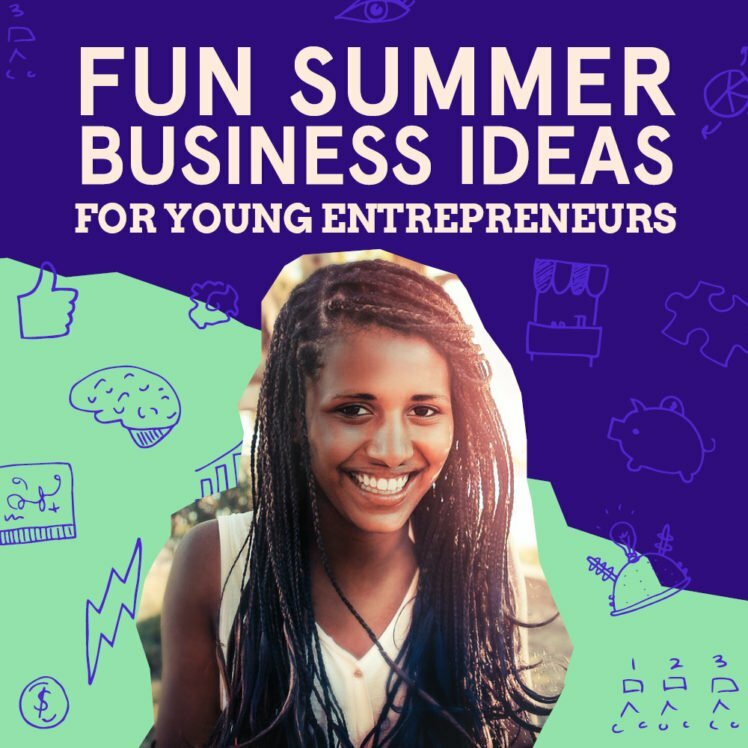 And while we are 100% in favor of lemonade stands, we also recognize that your young entrepreneur might be interested in starting a summer business that doesn’t involve pouring beverages. Maybe lemonade isn’t her thing—that’s okay. We’ve done some brainstorming and come up with several other ways an ambitious young girl can make some extra cash. Dog walking/pet sitting. Summer is vacation season, which means pet owners will be searching for people to help take care of their pets. If your daughter is an animal lover, providing some type of pet service for dog owners is the perfect side hustle. You can even make homemade doggie treats with your daughter (there are plenty of recipes online, like these) and use them as an upsell to pet walking, sitting services, even poop scooping. Or you can buy them from 11-year old Madison, an aspiring veterinarian who started Tons of Treats – her own line of organic and gluten-free dog treats. Crafts, jewelry and other homemade items. Is your kid creative? Resourceful? Platforms like Etsy provide a great way to sell her wares online. On Etsy, vendors pay 20 cents to list a product and then a commission of 3.5% on each sale. The policy for kids is that the Etsy shop must be owned and managed by a parent or legal guardian. If you think your daughter can’t earn money this way—think again. When 9-year-old Zandra Cunningham’s dad told her “no” to buying lip gloss, she decided to make some. Zandra started her own business, Azariah’s Innocence, right before her 10th birthday, and began producing and selling lip balms and body butter at local farmers’ markets in Buffalo, New York. She’s now 17 with an Etsy shop, website and production and distribution studio where she creates natural beauty and bath products with inspiring messages. She’s also been a TEDx speaker and has been featured in several media outlets. Lawn and gardening services. If your daughter has a penchant for playing in the dirt and helping things grow, she could charge an hourly rate for watering, weeding, planting, pruning and just basic gardening for those neighbors who want a lovely flowerbed or vegetable patch, but don’t have the time for it. Kidsgardening.org and Yard Care Gurus.com are great websites for learning about gardening basics. Face painter. Kids’ birthday parties, summer festivals, carnivals, tailgate parties before sporting events—these are all opportunities for artistic girls who want to offer their face painting skills. If you daughter has a creative flare and/or some artistic talent, face painting could be an easy and lucrative skill to learn as well as a fairly portable business to take on-the-go as needed. Create a podcast. Second-grader Eva Karpman, along with her mom, Olga, hosts the Dream Big podcast, a family-friendly podcast encouraging both kids and adults alike to not only dream big, but to take action toward making their dreams a reality. If you daughter has a big personality and aspirations related to broadcasting, television, entertainment or anything related, she might want to learn from Eva and step into the world of podcasts, which are fairly easy to create, especially with some technical help from an adult (if necessary). While this isn’t a guaranteed moneymaker right out of the gate, it’s a great way for your daughter to channel her energy into something she’s passionate about and learn how to monetize that. Help seniors with tasks like cleaning and grocery shopping. Hold weekend yard sales (a good time to break out beverages and baked goods, as well). Help throw birthday parties for kids (services could include blowing up balloons, decorating, making and decorating cupcakes, sending out invitations, and more). Babysitting services. While she may not be old enough to stay home alone with younger children, she may find opportunities to help entertain kids for stay-at-home or work-from-home parents. Party photographer and videographer (all she needs is use of a smartphone, a good eye and basic editing skills). Move garbage cans on trash and recycling pick-up days. Design websites or manage social media for family members and friends to start with (with the possibility of expanding as she gains skills). Teach younger children skills—athletic, artistic, academic, linguistic, technical or anything else she’s equipped to teach. For more inspiration, take a look at these girl CEOs who are running their own businesses and having a blast.